Workers led by national labor center Kilusang Mayo Uno, together with various sectors of society, condemned widespread contractualization and the pressing down of wages in today’s Labor Day protests, and called on Filipino workers to unite and fight the said government policies. Tens of thousands of workers and other sectors of society attended protests in various points of Metro Manila, Cordillera, Central Luzon, Southern Tagalog, Bicol, Eastern Visayas, Central Visayas, Panay, Southern Mindanao, Caraga, Socsargen among others. In Metro Manila, the protesters gathered at various points at lunch, marched early in the afternoon to Mendiola where they burned an effigy and held a program, and finally marched to the US Embassy to end the day’s protest. “We condemn contractualization, the pressing down of wages and other neoliberal policies attacking workers and unions. 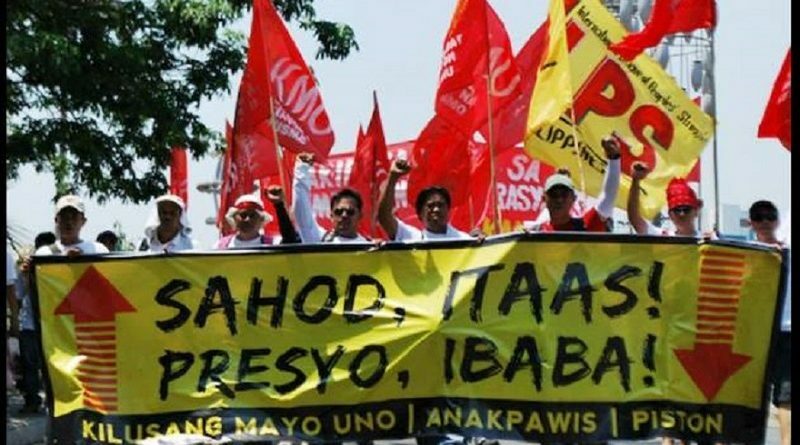 Workers’ basic needs are being neglected, workers’ basic rights are being violated, and workers’ basic dignity is being attacked for big capitalists’ profits,” said Elmer “Ka Bong” Labog, KMU chairperson. The labor leader said workers have to strengthen their unity and heighten their protests to push for the realization of presidentiables’ promise to end contractualization, and take to task the next president if he or she fails to carry out his or her promise on the issue. “True to the nationalist tradition of the country’s labor movement, we also condemn the US bases’ return to the country and the increasing US military intervention into the country. The Philippines’ sovereignty is wantonly being violated in furtherance of the US’ geopolitical interests in Asia-Pacific and the world,” Labog stated. The protest, which in Metro Manila saw the burning of an effigy of Pres. Noynoy Aquino depicted as a butcher, also condemned the chief executive’s six-year record on labor, marked the one month of the shooting and killing of protesting farmers in Kidapawan City, and called on workers to unite and fight for their rights beyond this year’s elections. Politicians led by vice-presidential candidate Chiz Escudero also joined the protest at Mendiola to express their solidarity in the struggle against contractualization and other anti-worker policies.